December 2018 - Delighted to announce that I have signed another 2 book contract with Avon, HarperCollins! June 2018 - Coming Home to Ottercombe Bay released as a whole story in ebook and paperback available from Sainsbury's, Asda and online. August 2017 - Escape to Willow Cottage released as a whole story in ebook and paperback. Track down the paperback at Sainsbury's, Asda and online. September 2016 - 'Willow Cottage' Part One gets a KOBO Bestseller flag! June 2016 - 'A Family Holiday' published as an ebook. June 2016 - 'It Started At Sunset Cottage' reached Number 1 in the Amazon.com Holidays chart! May 2016 - Cover reveal for part one of book 3 - 'Willow Cottage' due to be published digitally 7th July 2016. April 2016 - Cover reveal for book 2 - 'A Family Holiday' due to be published 16th June 2016. February 2016 - 'It Started At Sunset Cottage' shortlisted for Contemporary Romantic Novel in the 2016 RONA Awards! January 2016 - 'It Started At Sunset Cottage' now available in The Works in the UK. October 2015 - 'It Started At Sunset Cottage' now available in WHSmiths in the UK. September 2015 - 'It Started At Sunset Cottage' reaches number 4 in the Booksellers Heat Seekers chart! September 2015 - 'It Started At Sunset Cottage' reached Number 1 in the KOBO Romance chart! August 2015 - Thanks to Harper Collins Avon and revamped cover, It Started At Sunset Cottage is on sale at 800+ Tesco's stores as their Tesco pick on offer at £2! April 2015 - I will be doing my first public appearance at a multiple author book launch on 29th April at Coventry Library 6.00 - 7.30pm. There's free wine and cake! It's a free event but to book a place call 02476 832314. April 2015 - 'It Started at Sunset Cottage' will be out in paperback on 23rd April. Feb 2015 - My debut novel is now available as an e-book! Nov 2014 - I completed NaNoWriMo 2014 - 50,189 words in 27 days!! Nov 2014 - I have signed a two book contract with Harper Impulse part of the Harper Collins Publishing Group. I could not be more excited to be able to say that! My debut novel 'It Started at Sunset Cottage' is out 12th February 2015. Dec 2013 - So pleased to announce that I have signed with the Kate Nash Literary Agency. I have an agent! Nov 2013 - After one too many glasses of something fizzy at the RNA Conference in July I agreed to do NaNoWriMo. I have to say that at the time I really didn't know entirely what I was signing up to. As November loomed closer I was doubting the doability of the whole thing. But do you know what? I did survive and amazingly I have discovered that it is doable. I did loads of planning and had my novel mapped on my trusty cork board and a plan in Word to help me with the plot lines. When it came to it there I was every night with my head down writing. If I had a few minutes, I was scribbling. Lots of brilliant support from my lovely writer friends has kept me going - so THANK YOU! And I am very pleased to say that on Thursday 28th November I went over the 50k mark having written 50,365 words in 28 days. Whoop whoop! On Saturday 10th November 2013 I was named Runner Up in the New Talent Award at the Festival of Romance for the first chapter of my novel Acting On Impulse - I could not be more excited about this! 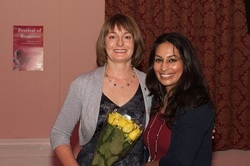 This is me with Sammia Hamer from Avon, HarperCollins who judged the competition. Big congratulations to all the winners on Saturday and especially to Lucie Wheeler who won the New Talent Award.